The Ecole Polytechnique Fédérale de Lausanne (EPFL) Blue Brain Project in Switzerland and the Allen Institute for Brain Science in the United States have built a computer model that simulates 12,000 neurons. This allows the scientists to learn more about brain waves and how neurons work and interact with each other. The Computer visualization on the left shows the brain waves produced by 100 detailed models of nerve cells. The strength of the signal is represented by the following color scheme: green = weak signal, yellow = medium, red = strong. Neurons behave differently from how computer chips operate. With computer chips, a steady stream of power is fed through it at a steady rate. Neurons transmit and process information that are sent in spikes. The Blue Brain Project aims to complete a working computer model of the human brain. Although the project has simulated 12,000 neurons, it is still a far stride from a complete brain which has billions of neurons comprising the nervous system. For almost a century, scientists have been studying brain waves to learn about mental health and the way we think. Yet the way billions of interconnected neurons work together to produce brain waves remains unknown. 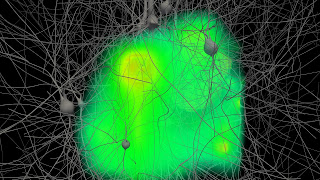 Now, scientists from EPFL's Blue Brain Project in Switzerland, at the core of the European Human Brain Project, and the Allen Institute for Brain Science in the United States, show in the July 24th edition of the journal Neuron how a complex computer model is providing a new tool to solve the mystery. The brain is composed of many different types of neurons, each of which carry electrical signals. Electrodes placed on the head or directly in brain tissue allow scientists to monitor the cumulative effect of this electrical activity, called electroencephalography (EEG) signals. But what is it about the structure and function of each and every neuron, and the way they network together, that give rise to these electrical signals measured in a mammalian brain? The Blue Brain Project is working to model a complete human brain. For the moment, Blue Brain scientists study rodent brain tissue and characterize different types of neurons to excruciating detail, recording their electrical properties, shapes, sizes, and how they connect. To answer the question of brain-wave origin, researchers at EPFL's Blue Brain Project and the Allen Institute joined forces with the help of the Blue Brain modeling facilities. Their work is based on a computer model of a neural circuit the likes of which have never been seen before, encompassing an unprecedented amount of detail and simulating 12,000 neurons. "It is the first time that a model of this complexity has been used to study the underlying properties of brain waves," says EPFL scientist Sean Hill. In observing their model, the researchers noticed that the electrical activity swirling through the entire system was reminiscent of brain waves measured in rodents. Because the computer model uses an overwhelming amount of physical, chemical and biological data, the supercomputer simulation allows scientists to analyze brain waves at a level of detail simply unattainable with traditional monitoring of live brain tissue. "We need a computer model because it is impossible to relate the electrical activity of potentially billions of individual neurons and the resulting brain waves at the same time," says Hill. "Through this view, we're able to provide an interpretation, at the single-neuron level, of brain waves that are measured when tissue is actually probed in the lab." Neurons are somewhat like tiny batteries, needing to be charged in order to fire off an electrical impulse known as a "spike". It is through these "spikes" that neurons communicate with each other to produce thought and perception. To "recharge" a neuron, charged particles called ions must travel through miniscule ionic channels. These channels are like gates that regulate the flow of electrical current. Ultimately, the accumulation of multiple electrical signals throughout the entire circuit of neurons produces brain waves. The challenge for scientists in this study was to incorporate into the simulation the thousands of parameters, per neuron, that describe these electrical properties. Once they did that, they saw that the overall electrical activity in their model of 12,000 neurons was akin to observations of brain activity in rodents, hinting at the origin of brain waves. "Our model is still incomplete, but the electrical signals produced by the computer simulation and what was actually measured in the rat brain have some striking similarities," says Allen Institute scientist Costas Anastassiou. Hill adds, "For the first time, we show that the complex behavior of ion channels on the branches of the neurons contributes to the shape of brain waves." There is still much work to be done in order to arrive at a complete simulation. While the model's electrical signals are analogous to in vivo measurements, researchers warn that there are still many open questions as well as room to improve the model. For instance, the simulation is modeled on neurons that control the hind-limb, while in vivo data represent brain waves coming from neurons that have a similar function but control whiskers instead. "Even so, the computer model we used allowed us to characterize, and more importantly quantify, key features of how neurons produce these signals," says Anastassiou. The scientists are currently studying similar brain wave phenomena in larger and more realistic neural circuits. This computer model is drawing cellular biophysics and cognitive neuroscience closer together, in order to achieve the same goal: understanding the brain. But the two disciplines share neither the methods nor the scientific language. By simulating electrical brain activity and relating the behavior of single neurons to brain waves, the researchers aim to bridge this gap, opening the way to better tools for diagnosing mental disorders, and on a deeper level, offering a better understanding of ourselves.